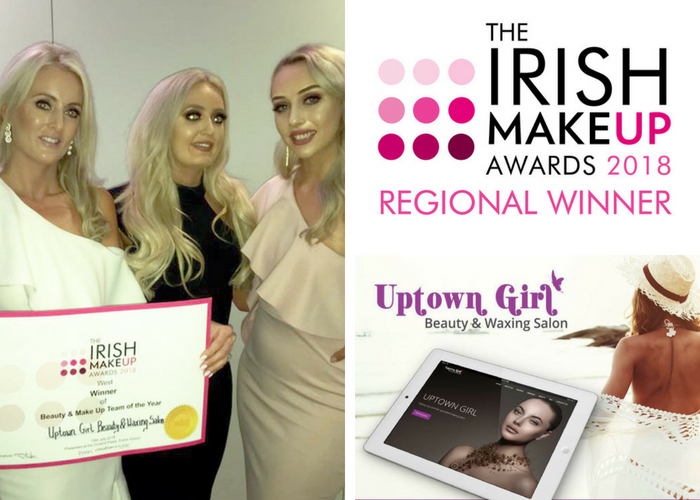 The team at Uptown Girl Beauty and Waxing Salon had a night to remember on Sunday as they were crowned Beauty & Make-Up Team of the Year for the west at the inaugural Irish Make Up Awards. The awards aim to celebrate everything and everyone that contribute to leaving customers with the best of impressions and meeting their needs; from salons to the talented individuals and teams that work within them. Owner of Uptown Girl Beauty and Waxing Salon, Amanda Griffin said the team were delighted with the award they received at a black tie event in the Crowe Plaza Dublin Hotel. "We are over the moon. This is our first award and we wish to thank all of our customers for all their nominations. We have the best clients in the world. We are very humbled and thankful [to receive this award.]" Irfan Younis, CEO of Creative Oceanic, organisers of The Irish Make-Up Awards 2018, said: "The Irish make-up industry has grown massively and this ceremony has been put on to celebrate and remark exactly that. We are very delighted by the response we have had from the public who were so keen to participate in our nomination process and vote for their favourite make-up artists and establishments. "The make-up industry needs to be recognised for its economic contribution to the country’s revenue, and we will continue pushing the businesses forward to showcase their impeccable work and give the excellent professionals working in the Irish make-up industry the recognition they deserve. "All finalists should feel very proud of themselves because it is their clients who have given them the green light to the finals." The excitement for the team at Uptown Girl will only increase as it heads to Dublin again in September for the Irish Hair & Beauty awards in September as finalists in the Salon of the Year category. For more information on what services Uptown Girl Beauty and Waxing Salon provides, visit Facebook page www.facebook.com/uptowngirl.galway. Is there a problem with your child’s hearing?